Who wouldn't want one of these eh? The Philips Mirrorwall - a huge installation of OLED panels linked together - is now on sale to the man on the street. 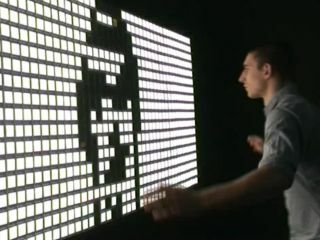 The panel uses hundreds of Philips Lumiblade OLED lighting panels and a camera to capture movement in front of it. It then displays that movement as a surreal and monochrome 'reflection' on the screen, meaning that you can see what you're doing mimicked in front of you! Of course, some might note that this is what normal mirrors do - but they don't cost €10k-12k per metre square. The installation is offered by rAndom International, and we hope that this cool looking wall is going to go into museums and large company receptions with more money than sense, rather than people's homes. But don't worry if you can't afford that outlay - you can still rent the Mirrorwall for €10k per week (but you have to pay extra for delivery. And installation. And insurance. And.... actually, just buy a mirror and get a lamp).